What is Gurbani’s view of Hindu Devi & Devtas (deities)? It is clear that these kings were normal people but people sung of them and made them out to be Avtars (incarnations of God) and hence they are referred to as “Devtas” or “gods”. Similarly the Pharaohs were glorified and projected as living gods and as God who kept creation alive and were the creators of the world. In eastern tradition, for example in Burma or China, any time the public saw the king or emperor people would lay down and prostrate and revered the ruler as God or incarnation of God. For example these figures are sometimes depicted with ten heads or ten arms. This is not to say that they looked like aliens because they were humans. Rather the ten heads is an artists way of depicting that the figure had the power of ten people etc. However, Gurbani is totally clear that no one can put a limit on God and God is unborn. No human can claim to be God. Just as no drop of water can claim to be the ocean. Gurbani is clear that God created countless Brahmas and Maheshs and Vishnus and all are under the power of One Waheguru. In the shabad “arbad narbad….” (Ang 1035) about creation, it is clear that there was no trinity and the origin is only God. God created these beings. It does not refer to a singular figure. There are many Brahmas; there are many Krishnas etc. There are many people throughout history who have been intellectuals, who have thought they are the creators etc. Guru Sahib tells us that in the world there have been countless intellectuals and scholars and there will continue to be. But, till now no one has been able to work out how Great God is and how many blessings is He bestowing upon living beings. Infinite are His virtues and infinite are are His gifts. Without God, no one can know this. This work is not in the capability of humans. That human is the greatest fool who claims to have bundled together all of God’s virtues and gifts. 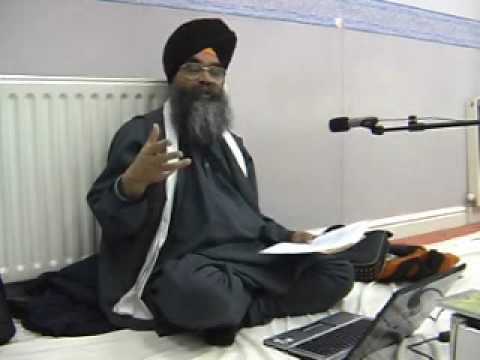 Although English translations are useful and provide great knowledge to Sikh Studies. However, through literal word for word Panjabi or Gurmukhi translation to English causes the implied meanings of a Shabad (hymn) to be lost and for a reader with little or no knowledge of Sri Guru Granth Sahib Ji, historical knowledge, grammatical knowledge, knowledge of smilies and metaphors, knowledge of culture and tradition referred to etc, the true meanings can be lost. « Was Sikhism created to defend Hinduism?